The foldable Surface Phone appears to be alive and well. Last week, we told you about the Andromeda Language Pack released by Microsoft that included some strings of code indicating that Microsoft's foldable device will have telephonic capabilities. Today, a patent that was originally filed by Microsoft back in July 2017 was published by the World Intellectual Property Organization (WIPO). 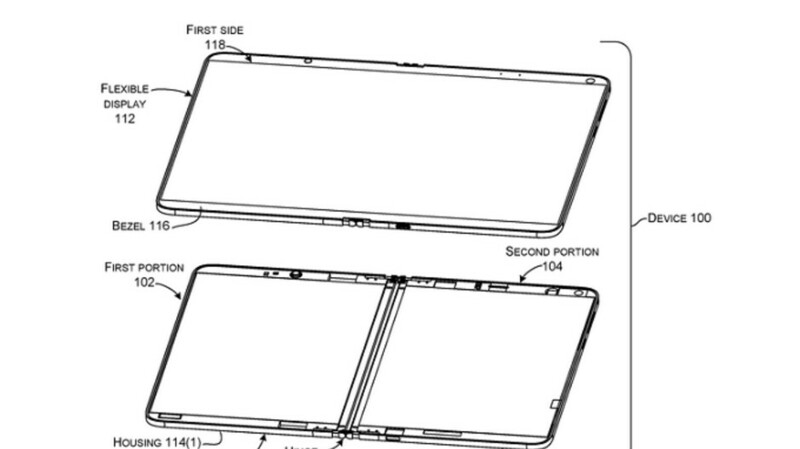 Entitled "Hinged Device," the illustration shows a big change to the first batch of patents related to Microsoft's folding Surface Phone. Instead of using two separate panels that fold inward, this patent shows one flexible screen that would use a hinge assembly and a "deployable bridge support." The latter would prevent the flexible screen from being flabby when fully open. Using a single flexible panel will also make the device easier to use when in tablet mode. There will be no line separating two individual displays, making it easier for users to write on with a stylus. Additionally, they will be able to view images and read text without the distraction of a physical line separating the edges on the two screens. It seems obvious that Microsoft would be targeting the foldable Surface Pro toward business users. This could be quite a productivity tool that would allow employees in the field to receive a call from the boss to make changes to a contract or a spreadsheet, convert the device into a tablet to make the changes, send the new files, and then get back on the phone to make sure that the office has received them. It's not so much that this can't be done now, but it is the idea that companies can arm employees with a single device that acts as a phone and a full-sized tablet. That's really detailed illustration.. Meanwhile on Apple sidehttp://www.patentlyapple.com/.a/6a0120a5580826970c01a3fc0ac527970b-800wi Bet they'll still sue Microsoft for this hinge patent. They're nowhere near the same. The Apple design uses fixed pivot points while the Microsoft design relies on an increasing radius hinge to avoid "pinching" the display. Hinge design looks really vague on Apple's patent, and it cover both inside fold (might pinch the screen), and outside fold (like this microsoft patent). They'll still sue MS even if it's only remotely similar. Hope this turns out to be a good one from Microsoft. Looks awesome, but i have no faith in MS ever creating a surface phone. Or a phone of any sort.